If you’re on Windows 10 or Windows 7, and you can only get stuttering, static or distorting sound coming out from your speakers and headphones, you’re not alone. You may find it impossible to listen to music, watch online videos or play games without getting bad quality sound. Irritating as it may seem, it’s possible to fix. Here are 4 fixes for you to try. You may not need to try them all, just work your way down until you find the one works for you. The screen shots here are from Windows 10, but all fixes apply to Windows 7 as well. 1) On your keyboard, press the Windows logo key and R at the same time. Type in mmsys.cpl and press Enter. 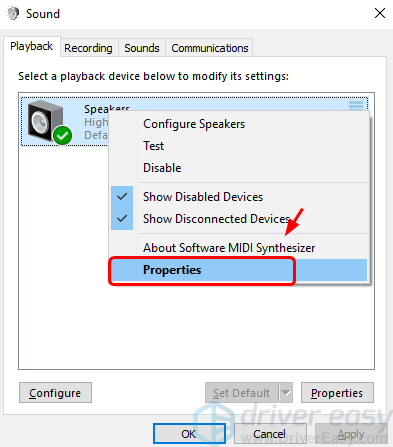 2) Right-click your default playback device (the one with a green tick) and click Properties. 3) Click Enhancement. Make sure the box for Disable all enhancements is empty. Click Apply and OK to save. If you don’t have an Enhancement tab here, the culprit is not enhancement then. Move on to methods below for more help. 3) Click Advanced tab. Select 16 bit, 48000 Hz (DVD Quality). Click Apply and OK to save the changes. 4) Test to see if your sound is still stuttering. If yes, go back to step 3 and try some other formats until you find the one works for you. If your audio problem remains, move on to method 3 for more help. 2) Mark down the name of your default sound device. The screen shot shows High Definition Audio Device. Your could be different. 3) On your keyboard, press the Windows logo key and R at the same time. 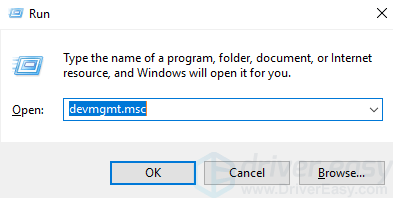 Type in devmgmt.msc and press Enter. 4) Double-click to expand Sound, video and game controllers. 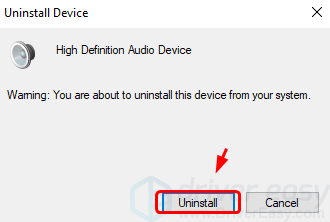 Right-click the driver for your default audio device and click Uninstall device. 6) When the uninstall finishes, restart your computer. 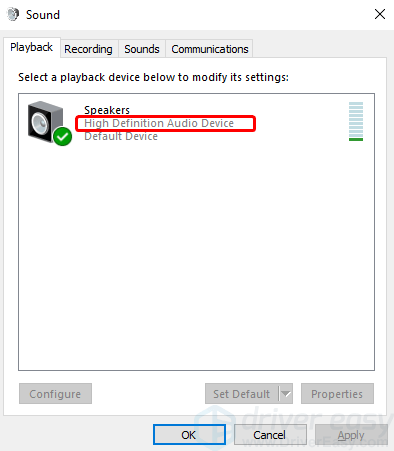 Windows will automatically find and install a correct audio driver for you. 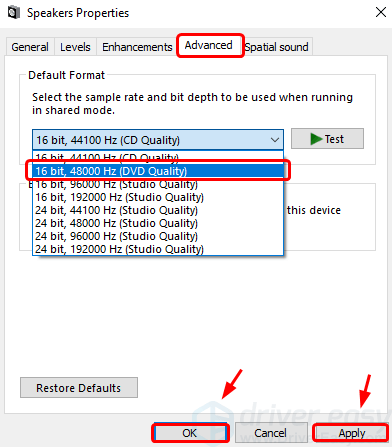 If your sound is still stuttering after reinstalling audio driver, move on to the method below. 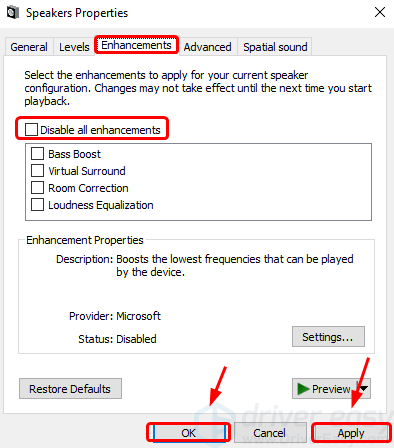 If, trying all the above, your sound it still stuttering or distorted, it’s time to update your audio driver to the latest version available. 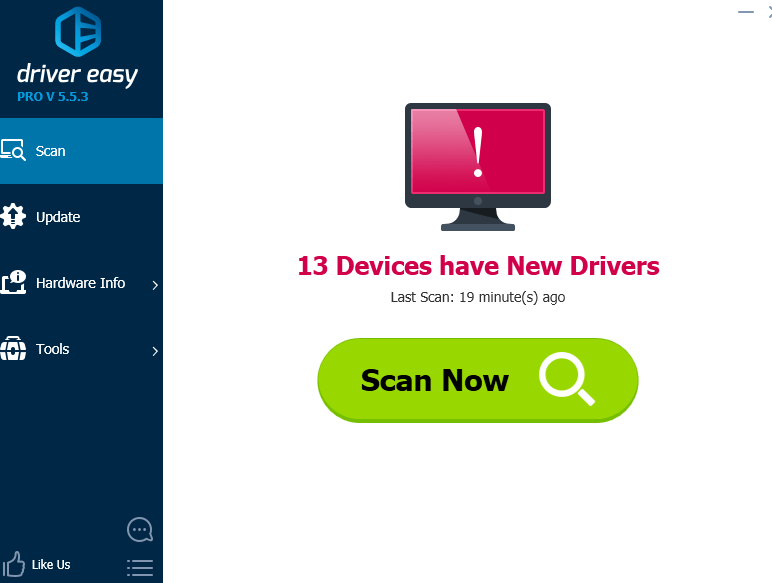 If you don’t have the time, patience or computer skills to update your drivers manually, you can do it automatically with Driver Easy. 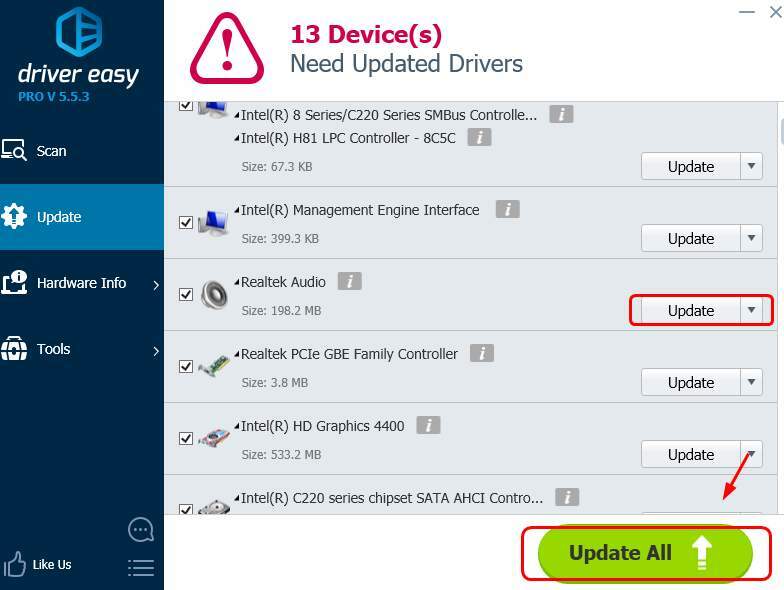 3) Click the Update button next to the flagged audio driver to automatically download and install the correct version of this driver (you can do this with the FREE version). If you need more help with your audio issue on Windows 10, feel free to leave us comments and we’ll see what we can do to help.